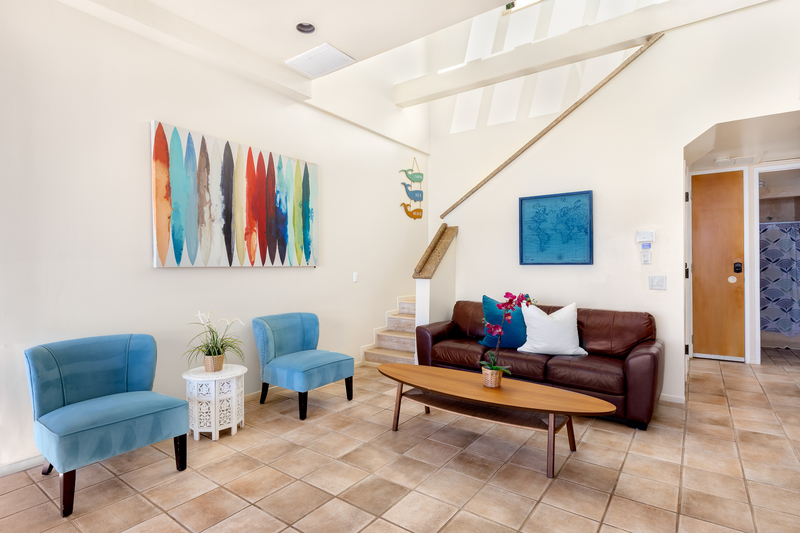 This home is the lower level of an oceanfront duplex, sitting on a bluff overlooking the Pacific Coastline. 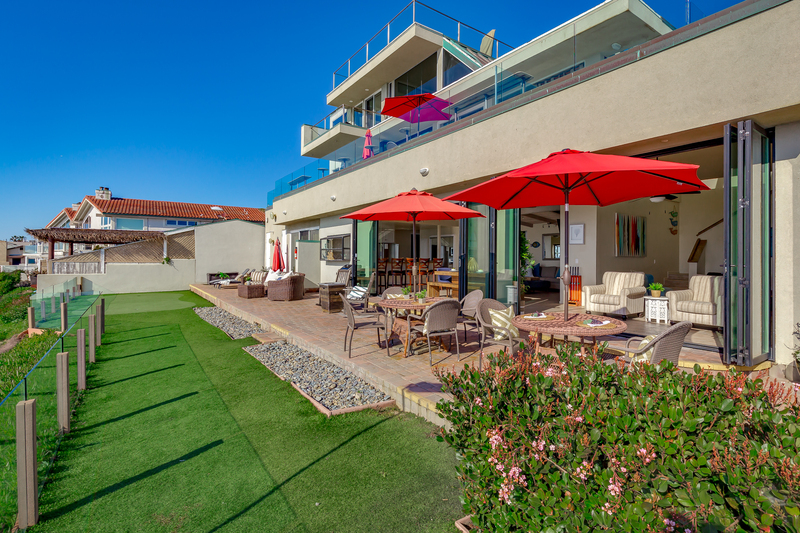 There is a large oceanfront patio, with a private spa, patio furniture, barbecue, and a private putting green! Practice your putting skills as you watch the surfers down below! The kitchen, with granite counters, opens up to the family room area, which has a fireplace. 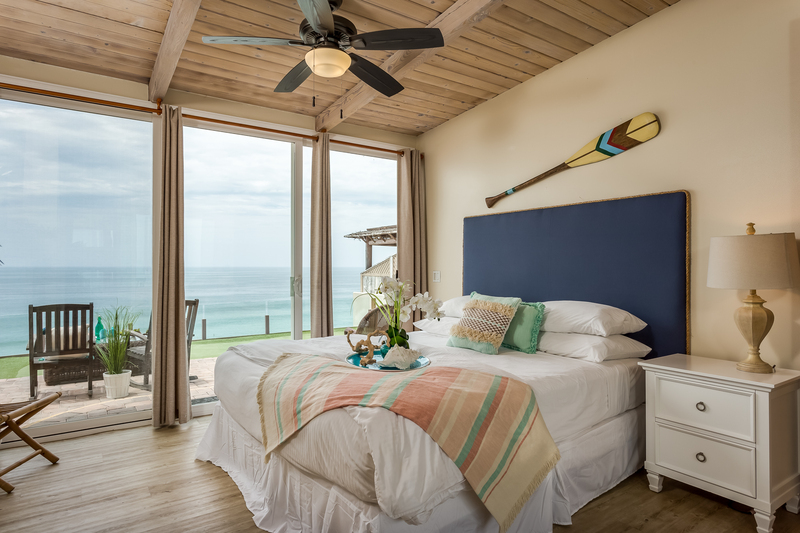 There are two master bedrooms, one with access to the oceanfront patio, and the other lofted above the living room, with amazing views of the ocean. Central AC is available to help cool you off on those hot, sunny days. Beacon's beach access, a famous surf beach, is located directly next to this vacation rental. You'll fall in love with the location of this home! 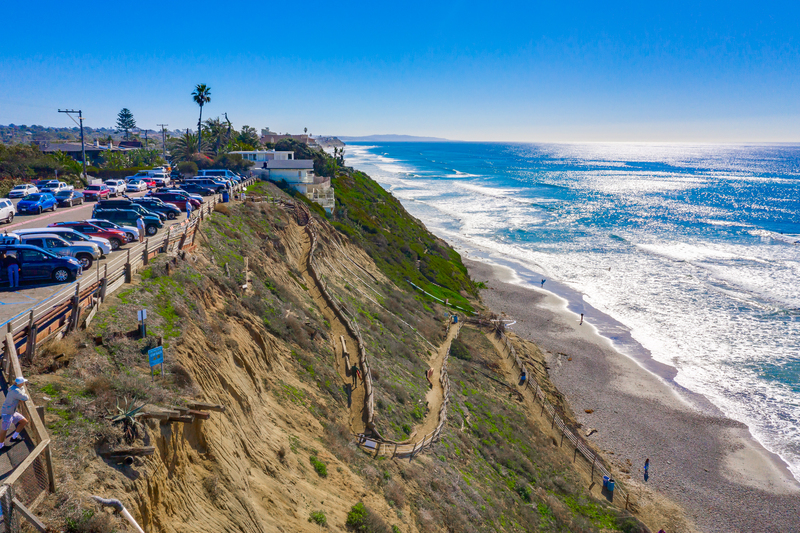 The adorable beach town of Leucadia, Encinitas boasts quaint boutiques and shops, delicious restaurants for any taste, and coffee shops and cafes to spend a lazy morning. As you stroll down the Coast Highway, on a weekend morning, you'll come upon Seaside Bazaar, a fun outdoor marketplace and favorite of locals and visitors alike. 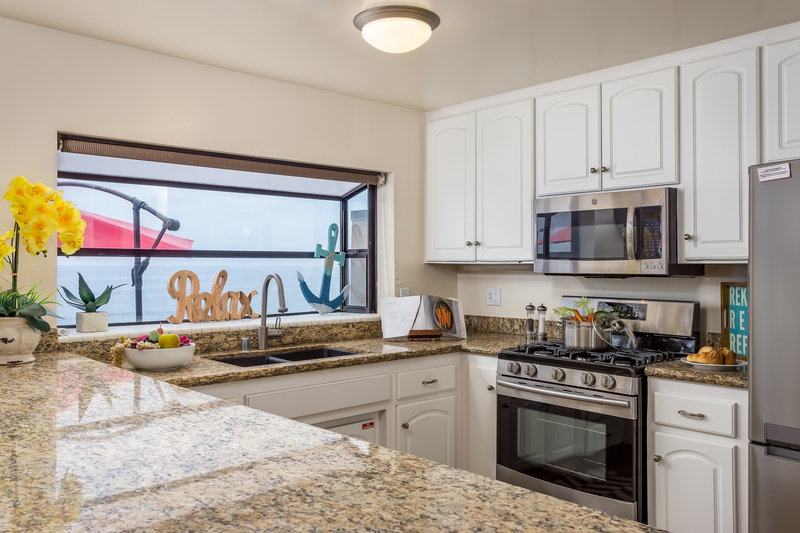 In the evenings, make a home-cooked meal in the fully stocked kitchen of your oceanfront rental as you watch the sun go down over the ocean. 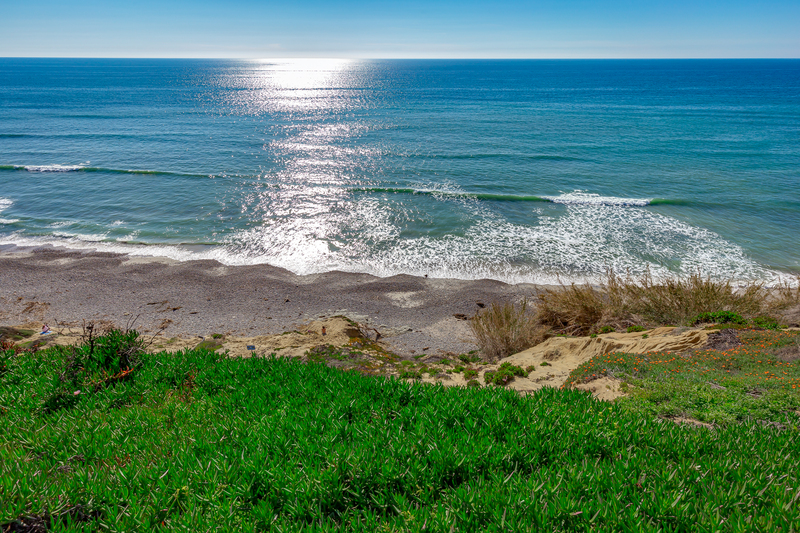 If you'd rather go out, Encinitas has plenty of quality eateries to suit your tastes. There are local neighborhood eateries such as Honey's Bistro & Bakery, a quaint cafe that serves freshly brewed coffee, breakfast, and lunch items along with various flavors of smoothies. *The San Diego Airport is roughly a 35 minute drive. We were 100% satisfied with this rental. Breathtaking view. The property was exactly as described. It was superb. Beautiful decor, everything in working order. Manager provided great customer service. We only needed a few questions answered prior to our stay. We had absolutely no need for customer service while at the property. I recommended this property to a friend while we were staying there. I sent her pictures. I think she may rent this house also. We mostly enjoyed the property itself. We used the putting green and outside area the most. We went down to the beach and walked. One day there here were dolphins and a Whale swimming out front. We had dinner at the Chart House nearby. We also ate at restaurants that were within walking distance from the property. Great memories. WOW what a wonderful view! I booked this property for a retreat, and what a retreat it was! The open concept dining/living room was plenty large enough for us to hold meetings, meals, and devotionals. Each person had his own bed to sleep in and the beds were great. The back yard has a stunning view of the pacific ocean, and the setting was incredibly peaceful. The hot tub was clean and just big enough for four adults. The putting green was a nice bonus. We did experience a lack of power in the upstairs bedroom and bathroom during the evening. An employee was out the next morning to remedy the issue. This house is within walking distance of some wonderful local restaurants. Over all we were very pleased with our stay. House is perfect and we had wonderful time. Best sunsets and our large group had separate room for all. Close to great restaurants and everything you need and we are now planning annual trip. Beach rentals does great job too. Beautiful view and house. Loved ending the night with a dip in the hot tub looking at the stars and loved waking up and having coffee looking at the ocean. Enjoyed amenities like the fire pit, hot tub, golf putting green, outdoor furniture, all kitchen items you can need, and so much space. House was clean and decorated super cute. Great space for family and friends to gather and enjoy the view. We loved the house and the view. But upon arrival a young man was cleaning the windows, we asked him to please finish his work but as we unloaded our things he quietly left so the windows were not very clean. Also the fireplace didn't work. That was disappointing as it got chilly in the evening. The pilot light came on but we couldn't get it to light up. Otherwise it was a very nice experience. There was one bedroom attached to another where there are two full size bunkbeds... I wish there was a door for privacy. There is no door between those two bedrooms. My son used the spa and enjoyed it but said you lose the view when you are in it. Your view is blocked by a bush and the low level. These things were minor overall and we enjoyed our stay. We would recommend this beautiful beach house and would enjoy coming again in the future. Had a great time at this property. Location and views could not be beat! Enjoyed the amenities. I was disappointed in the beach access from our property. The kitchen utensils , ie. scissors, can opener, etc. did not work well. We bought our own once there. There were not enough recycling trash cans. The counters in the bathrooms were unusually and uncomfortably high. The quality of the work done on the property was substandard. The inside/outside gathering space was fabulous. Amazing view but disappointed in essentials! This house has an amazing view, great location and patio! We had 6 adults/6 kids in our group and plenty of beds/baths for everyone. The only negative is the property is not equipped with enough in the kitchen. We had to run the dishwasher lots to have enough utensils to eat our meals, and finally bought plastic so we didn't have to bother. There is a bare minimum of cooking pants/1 tupperware/no foil or sandwich bags for storing left overs and no basic spices. Our biggest complaint is a house this big and expensive comes with no beach chairs and no boogie boards. We had to buy all of this after our arrival. We have been renting on Neptune for over 20 years and have never rented a house that is missing so much! It would not cost much for the owners to stock the kitchen with some basic spices and more utensils/pans. We rented a few blocks south on Neptune the next week and the house had everything! Just made a big difference not having to buy so much. Also, be aware that this house has no garbage disposal (again could install for so little) and it resulted in us having to empty garbage 3 X a day! Fabulous location and very clean! Beautiful decorated and convient . Easy arrival and departure. This was my 3rd time staying at 950 Neptune. It was phenomenal again and again. The unusually hot temperatures in San Diego area made it a little challenging to cool the house. Also, leaving the sliding door glass doors open helped with a breeze however there was a squirrel lurking around that wanted to come in. Screen doors would help, but probably not practical in the big living room doors. Some kind of shading more than just the 3 umbrellas would make it easier and more doable to sit outside from noon until about 6-7pm. But I'll be coming back. Already have reservations for next March, and may be back before then. The pictures do not do this place justice! This house is perfect for large families, couples or, groups of people. 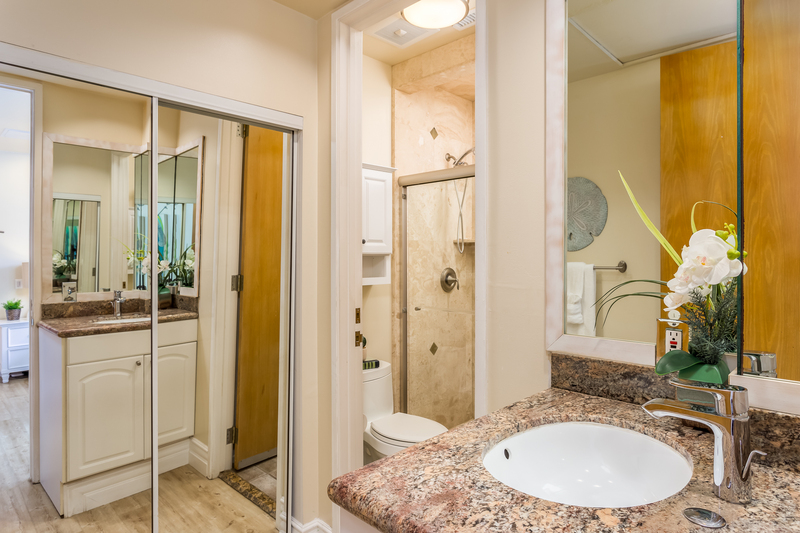 With the 5 bathrooms and 5 rooms spread throughout the house you have a sense of privacy and never feel crowded. We enjoyed every moment of the house and had nothing planned but quality time and the beach. The sunsets are absolutely breathtaking. You learn to appreciate the solitude of just the waves and complete darkness to enjoy the stars. The property was clean and did have everything we needed. Management is great about taking suggestions and supplying missing items. You do face the west so the afternoons can be quite warm if you are sitting in the house. They do have air, however; we didn't find that it worked very well. We kept the doors open and the umbrellas up. There was an issue with flies since we always had the doors open. Most places don't stock enough of the paper essentials needed, so we brought extra napkins, foil, and ziplock bags. This way you can store any leftovers. They have a great beach below the house that is not heavily populated. You do have to go down a fairly steep and slick hill to get to the beach. You also have to be able to go back up it. This was a little challenging for my parents but they were able to enjoy the beach one day. If you seek a serene get away, this is your place! loved the putting green! There were a few issues but overall great vacation!! Great experience! Good communication, easy check in / check out and an incredible house with an even better location! We were very happy with the property. The house is beautiful and the view is outstanding. the house and location was fantastic. the sunsets were amazing. This place was better than the pictures show!!! The view was everything we’d hoped and the putting green was a big hit too. Beds & linens were excellent. It was VERY clean! The place needs some TLC; little things that were broken like garbage disposal and coffee grinder. Fire pit was a Walmart special, it was neither attractive nor effective. Hot tub is way too small for such a large unit; 2 adults max capacity. When I called to ask Management Co. about the parking situation I got absolutely no useful information; the person I spoke with knew nothing at all about this partcular property. The house is amazing. Great views, beautiful furniture, lots of great comfy beds. Great place to stay for a group. This home is lovely. The location is perfect. And the team who helped us put it all together is professional. If you're looking for a place to land for your next vacation, and you have a gaggle of friends/family, then this place could be perfect. 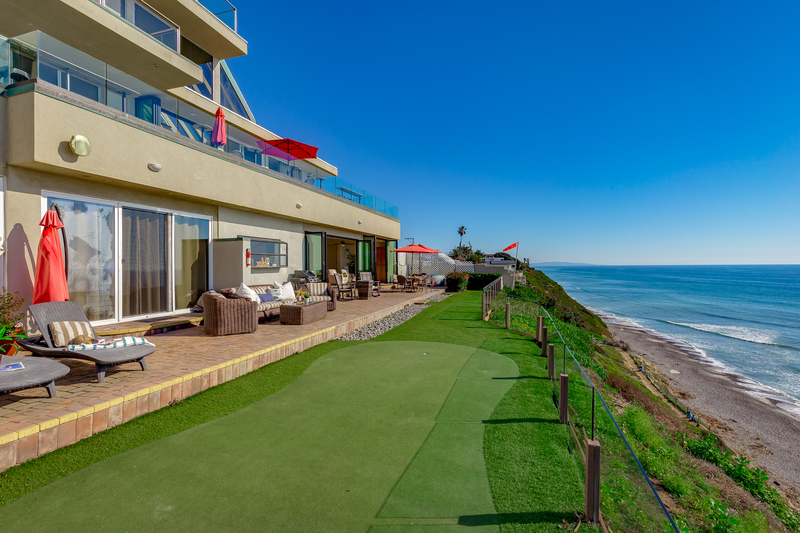 The putting green is fun, the view is spectacular and the amenities are pretty good. Given the high price, it would have been nice to see some updates on some of the home, and all things in perfect working order, but all in all, things were nice. If you're expecting visitors, tell them to Uber, as parking is a pain. And if you're expecting "pure luxury" this isn't the place. Again, it treated us and our party very nicely. Our family had not begin together in years - so we were so looking forward to our stay. This property was perfect for us - there were 14 of us and one infant! The house was clean and well stocked with dishes and games. The view was spectacular! There is a walk to the beach but it was great exercise. It is right next to the parking lot for beach entrance but noise was not a problem. We called the management company about a couple of "how to" questions and there were very responsive and helpful. 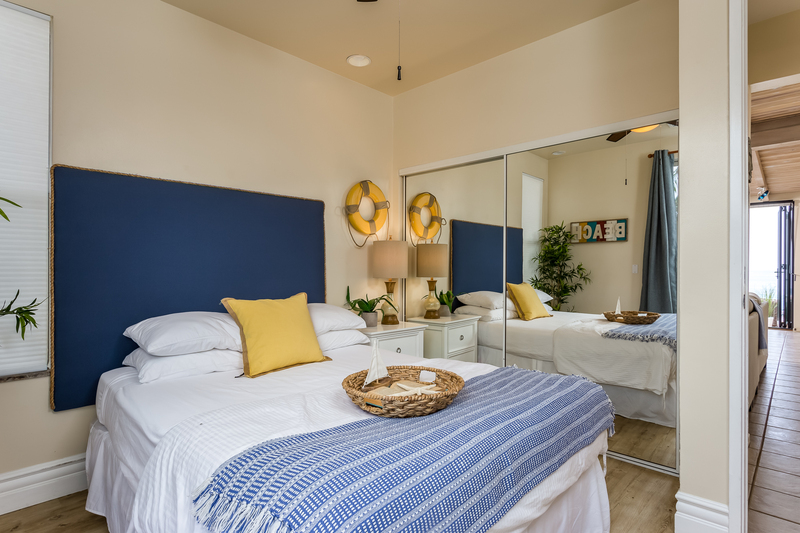 Also close to local attractions, Seaside Fish Market and coffee houses close by!!! Hoping to visit again soon! This is a perfect setting if you want 2 or 5 bedrooms/couples to stay and not feel like you're falling all over each other. Awesomely delightful view of the ocean while using the kitchen, dining area, watching TV or just hanging out chatting, playing games. Everything is so conveniently ocean view oriented. My 2nd time staying here. Coming back. Wonderful place on the Pacific Ocean, beautiful views,Easy walk down to the beach, right next to world famous surf Site, Beacon's. Putting green was a bunch of fun for all of us. The property was not clean referring to the floors, counter tops and dishes. Dishes were dusty and some of the silverware had dried food on them. The floors were dirty. The air conditioning units did not work and several times we had to call for assistance. We received air after two days of being in the heat, yet the maid service came at exactly 10 on our check out day. There should have been a grace period for us or a return of some monies due to the challenges we encountered. Even after the experts came to service the air conditioner, it was still hot. The gracious gentlemen who came in to service said the system needed to be replaced and they did do extensive work on what was already in place. They discovered that one side of the house had air, the other side did not, which affected two bedrooms, two baths and the den. This made it quite uncomfortable in these areas. They informed us that they would be sure to update the owner with this information. We stayed here with 4 other couples to celebrate my wife's birthday. 4 of the rooms have king beds with connected full bathrooms and the 5th has a queen with a full bath around the corner. Master suite opens onto the back yard, so we left the door open to listen to the waves crashing at night. The house and location were great...close to bars, restaurants, shopping, etc. The backyard is amazing! When at the house, we spent most of our time with the back doors open enjoying the cool beach air while playing around out back. So great to enjoy a beverage, watch surfers, hit balls on the putting green, and take in the gorgeous sunset. I would definitely recommend it and hope to return! We had a great time at this property...we all needed to unwind and enjoy the ocean breeze and to catch some rays!! Great place to just chill and relax. Beautiful views and spacious living!! wonderful home with incredible view and easy access to beach. cannot say express how grateful we are for the opportunity to spend a few days with my parents and their friends for their 75th and 80th birthdays. everyone was blown away by the house and the gorgeous view. thank you so much. hope to stay there again. Had a great time. The Condo was clean, had amazing views, great access to the ocean, and good space. The putting green was a fun add-on but the hot-tub was really shallow and small. The check-in and check-out policy is quite strict, and the access to the trash from our unit was non-existent, but overall this was a fantastic spot. Our family vacation for 11 was such a great time. Everyone had their our bedroom and bathroom which made it so convenient and comfortable. The location and view were perfect, such beautiful sunsets in the evening. It made for a wonderful time for all, we are talking about doing it again!Staff was extremely helpful and made the reservation process very easy. The facilities were very nice and we had a great time. If I had four complaints one would be that the hot tub is kind of a joke. It barely fit 3 adults in it. Secondly there were no shot glasses and the wine glasses were incredibly high up off the ground. Thirdly the knives needed to sharpened in the worst way possible. The last complaint was that we only had one tv that could access the cable and the wifi went out a few times. Other than that it was a great place to stay for a lot of people. The house was clean to the spot. The view was amazing. Very spacious with all the daily necessities. WOW! Just wow. From the minute we walked in the front door, that's all we said for about 10 minutes straight. The rental is in a very convenient location; walking distance to shops, coffee, restaurants and of course, the beach. The house is fully stocked with everything you could possibly need, tons of space for everyone and incredible views all around. This is a very well appointed house. It has nice bedrooms and an open plan living area that is extremely pleasant and very comfortable. The view is wonderful and the beach access is convenient. It had been a few years since we rented this property, so it was fun to see the upgrades that happened in the meantime. We loved coming back again - you can't beat the view. Heads up - all the counters in the bathrooms and kitchen are much higher than standard height. Management was very responsive to address an issue with the property. This is a clean and spacious home overlooking the ocean. It would easily sleep the 15 people and there are plenty of areas on the property to relax! Even the day it poured rain, we enjoyed watching the waves and the rain. Perfect location to access restaurants and Sea World. We hope to be able to come again. Thank you!!! 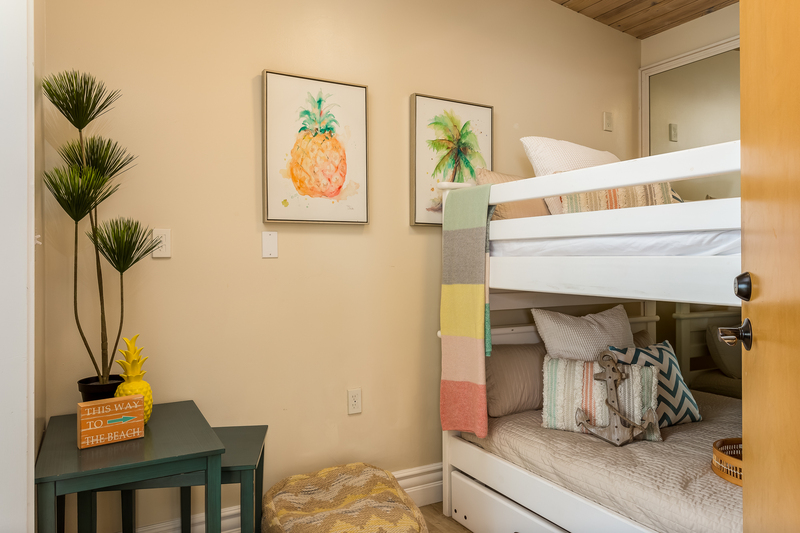 Our family was able to enjoy a multitude of activities while staying at this location, Disneyland, Legoland, morning runs on the beach, leisurely playtime on the beach and in the backyard. We had room for everyone to relax and even the dogs relaxed. Thank you so much Diana, for going the extra mile and talking to the owner to get approval for our dogs. The perfect house for a large group with the perfect location.Everything was as good as viewed on the web site or better. Great place to stay as families or adults, It's in a very secluded and quite beach. The place is like a resort, the view is spectacular. Amazing Place for All of Your Needs! I rented this place for an international team meeting this past week and could not be happier. The location, environment, and ambiance all played an essential role in conducting a productive meeting. Everyone, which included people from Finland, Brazil, Holland, Germany, Canada, Mexico, Thailand, New Zealand, Australia, and the US, were all very excited to meet and work at this amazing house in Encinitas! The organization leading up to and after our stay was top knotch and will definitely be looking to Beachfront for future reservations! came to enjoy this luxury beachfront home in Encinatas. What a shame the owners of this home have not employed better management. We were without air conditioning on two nights, and poor response from management when we immediately let them know of our distress. Many outlets did not work, coffee pot was broken, etc. I have rented from VRBO before, but must admit, I will think twice before using them again for our rentals. This beach house rental is so amazingly relaxing. The view is breathtaking whether you're outside or inside with the doors opened. It's a must see. Great rental. Overall was happy with the stay. Things to mention is the walk down to the beach with small kids is hard. 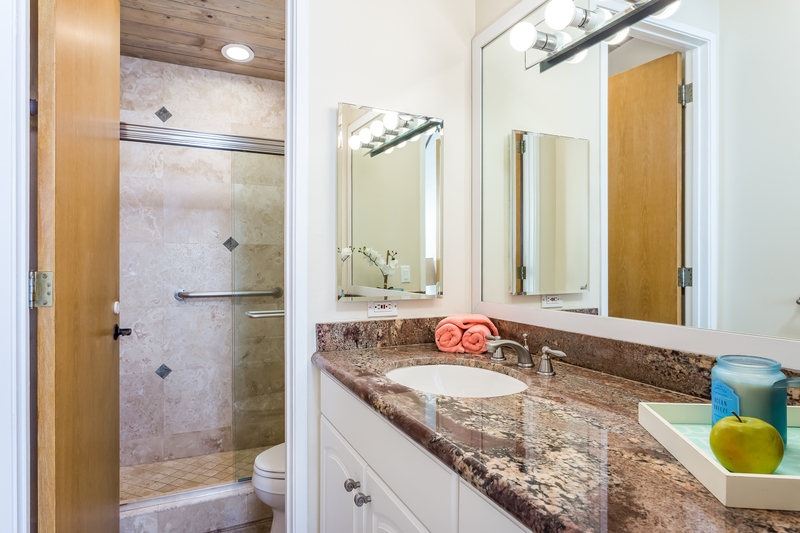 Master bathroom has limited storage room as does the kitchen. Will comeback for another stay in a few years. This is our third year in this rental and we love it!! There have been recent remodel and decor changes that we love and enjoy. The beds are very comfortable and the patio and views just gorgeous. 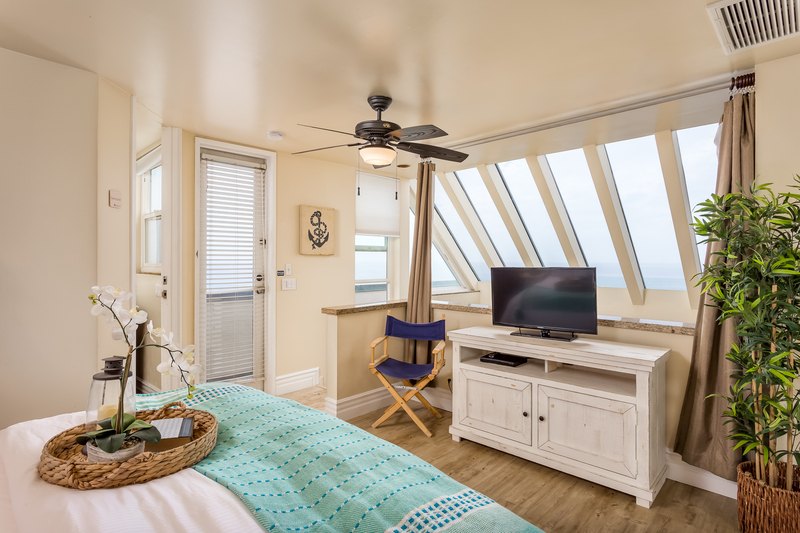 Close to the coaster for quick easy stops from Oceanside to Old Towne San Diego. Love the Encinitas atmosphere and farmers market. My family and I celebrated my mom's 80th birthday here. Ten adults stayed for three nights. We loved the location, views, and accommodations. The home had plenty of space and everything we needed. We barbecued each night and sat outside by the fire pit after dinner. We surfed, rode bikes, and walked during the day. This house is amazing. We would definitely stay here again. Excellent Place for A Business Retreat! Conducted a team meeting at this rental for 2 days....perfect place to get away! we loved this location and home. the only slightly weird thing was the unusually high counter tops in the kitchen and most of the bathrooms - this was challenging for the short women and kids in the family. seems as though the space was designed with a taller individual in mind BUT this could very easily be fixed with step stool(s) available or easily identifiable in the unit. Also, the TV in the upstairs bedroom was not working. We recently had a family reunion here and it was one of the best times of our lives. The property location, size and amenities was just perfect for a family of 10-12 people. The huge windows overlooking the ocean was just amazing day in and day out. Everyone had a blast. Only minor downside is the beach access - since this is on a cliff, you need to walk through a zig-zeg path next to the beach house. If the beach access was easier than that then it would have been ideal as we had kids and it would have been great if the kids could just walk right up to the beach while the parents watched over them from the patio. Highly recommend this place for anyone. Its just awesome. Beautiful property, within walking distance to everything. We looked at many websites to find the perfect home for our family to celebrate a birthday and have quality time together. We are so pleased with our experience, we are already planning our next visit!!!! The views, the home, the location, everything was absolutely perfect! Wonderful property. Gorgeous view, large patio with fun putting green. Well furnished and supplied. Our group of 5 couples lived it. The book inside the house was very helpful about restaurants and things to do. This was an excellent rental. a few very minot problems were handled immediately. Whole family had a great time. View was a million dollar view every single day. The property was beautiful and the view amazing. BFO makes everything so easy! We will definitely stay here again!! Our church staff of 10 enjoyed this amazing condo and location. I'd highly recommend it to groups or large families. Its a great place to stay. very relaxing place, clean and well maintained. love it! The view and the panarama doors were the highlight of this beautiful house. The putting green was a hit with my 3yo. The beach access was really close but not easy for older people or little kids, doable but not easy. We went down to Moonlight for easier access. The house is a short walk to great food and coffee shops and a short car ride to even more great stuff. The house was clean and well appointed. The staff was great. My only complaints were about the upstairs neighbors and the lack of air conditioning in the loft space, which had a wall unit but never cooled down enough to sleep there. We left it empty all 7 nights because it was just too hot and you can't open the patio door unless you are also renting the upstairs, which I felt could have been worked out a little differently so you could cool the loft. Over it was a fantastic place to stay. great staff support from dina. good location for daily walks on the beach. the stereo was not working but would have enjoyed music. would have been helpful to have non-perishables available such as coffee filters, Ziploc bags, tin foil etc. additional lighting in the kitchen and front rooms would be helpful. Overall, a great stay and will recommend to others! Amazing 180 degree view of the ocean! Three families (6 adults/5 kids) enjoyed this property and there was plenty of space for us all. We enjoyed being able to walk to dinner each night at a variety of terrific restaurants. A great beach vacation!! We had a wonderful time in Encinitas. The location couldn't have been better -- easy access from highway, on the beach, easy access to playgrounds, grocery stores, and them parks. Its a very strange house - for instance, all the kitchen and bathrooms counters are above chest height -- built for a family of giants? And the layout is odd. But the location and hot tub were all that mattered! Upon arrival we were blown away with the location, size and overall appointments and ammenities. Everyone in the group took down the rental information for their own use in the future! We would not have enjoyed this property if the property above us had been occupied. This is a duplex. However, since no one was staying above us, we enjoyed staying on the patio, which is where we stayed the majority of the time. The putting green and ample seating added greatly to the comfort. 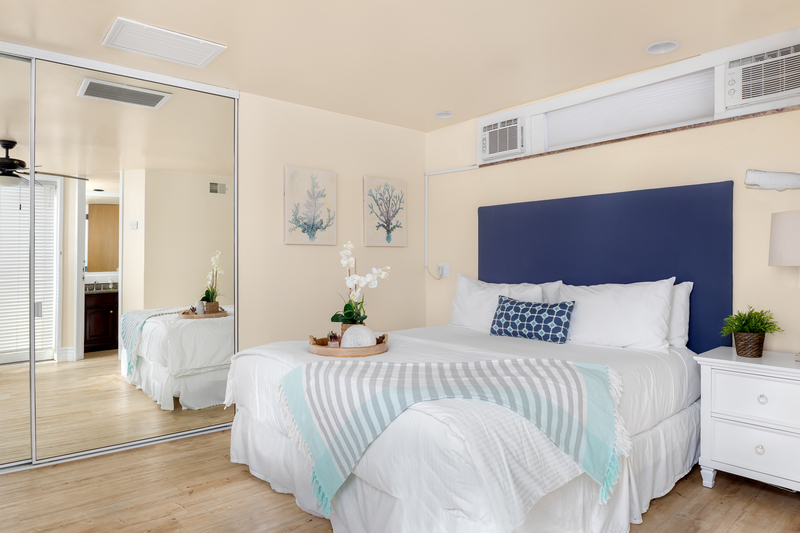 From the first moment we spoke over the phone to Sheva from the Team at Beachfront Only Vacation Rentals, we were very impressed. Sheva was knowledgable, professional, caring and extremely helpful with all of our questions about the area and the property. We will rent again here very soon it was that good!! The only reason why we gave 4 starts under the category of "property clean" instead of 5, is that we suggest you clean the carpets in the bedrooms because our feet and socks were dirty after walking around. The staff was very attentive; for example, we had a very minor problem with the barbecue. After a quick phone call they had a person out immediately to make the necessary adjustments and the barbecue worked well after that. Outstanding ocean views, weather was excellent, numerous dolphin and seal sightings directly in front of us in the ocean, the walk down to the beach was easy and convenient. Our family really enjoyed the beach and related water activities. We strongly recommend this property and we will be back soon!! Thanks for a wonderful vacation experience. This property lived up to our expectations and then some. It was the perfect setting for our family and we wouldn't change anything about our stay..except we weren't ready to leave when our 5 days were up! We had an amazing time, relaxing, inspirational,one of the best times!! Would be nice if some basic kitchen expendables were left behind by previous renters, i.e. : Tin Foil, Zip Lock bags, Sugar, spices, etc. not necessary, but that would be nice. A lot of the electrical outlets did not work. with all of the electronics we travel with now a days, everybody is looking for power, everywhere ! We did see several rats on the back porch, one was actually in the BBQ grill. Didn't really bother me personally, and I know they live right there on the hill, but maybe there is some kind of deter-ant ??? Hoping to be back SOON !!! We have fixed all electrical outlets. Thanks for letting us know! We do try to control the outdoor critters as best we can but Mother Nature. Beautiful, clean, extremely comfortable! We had a little trouble figuring out the light switches, but otherwise, a wonderful vacation! My boys loved the golf green. Highly recommend. Amazing property with a view to die for. We didn't think we'd use the ocean-view putting green but it was a big hit with everyone. Lots of room for a big group with plenty of nice bathrooms. A few minor complaints - dim lighting, not enough food storage in kitchen, and a tiny closet in the ocean-view master - but we all had a wonderful time. The condo was immaculate and the management company was outstanding. I would definitely recommend this property to friends. It was amazing. I took my girls to the beach for a week of healing. Their dad recently died. The house was amazing. There was so much room for everyone to have their own space. Everything was so nice. The kitchen was equipped with everything we needed. Not once did I reach for something and did not find what I needed. The home was clean and homey. We are coming back next year for longer. Amazing views, great beach, beautiful home! Just stayed 4 nights at this location. Home is very well equipped and has easy access to the beach below via the lot next door. Putting green was great for the family of all ages. Would definitely stay here again. 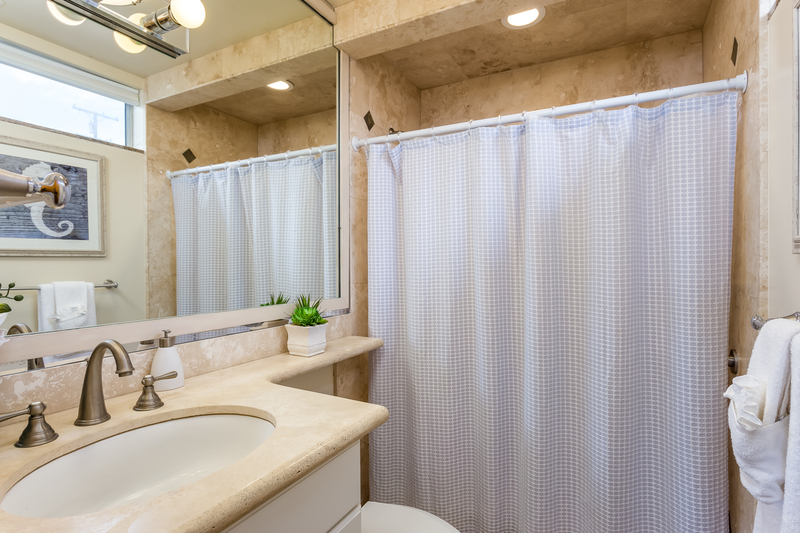 If you're tall you'll love it even more - high counter tops and shower heads positioned for a giant! Only downside was the upstairs unit was rented for 2 of the 4 nights we were there and we could hear a lot of noise from them. The jacuzzi is also pretty small and shallow, but it was fine considering only 2-3 people were in it at a time. We loved everything about this unit except there was a lot of noise from the unit above. The floor is tile and we could hear every footstep, a chair being moved, people talking. Even so... we might go back again and cross our fingers that nobody is renting upstairs! My family and I rented this amazing property to celebrate my Mother's 70th birthday. Several of those in attendance came in from the east coast. It was wonderful seeing everyone's reactions as they entered the front door for the first time. Being able to watch the surfers and the dolphins during the day and the miraculous sunsets every night was breathtaking. There were several days where no one wanted to leave the house at all but whenever we did there was so much to do in the area. We especially loved the wine bar down the street, Solterre Winery & Kitchen. They have all asked if I can make renting this property a new annual family tradition. I hope to be back soon! sliding doors hard to open.You can hear people above even though I was told unlikely.Next to parking lot for surfers sometimes cars pull up with music very load early in the morning. Beautiful weather, very noisy into late night Friday- Monday from across street and top of duplex. Few items in kitchen not working properly. Great beach access. Fits large family of 10 nicely. This is our second time renting a beach place in this area, and we love it, just might pick a different house or quieter weekend next time. We loved our stay and would love to go back! The views were amazing!! 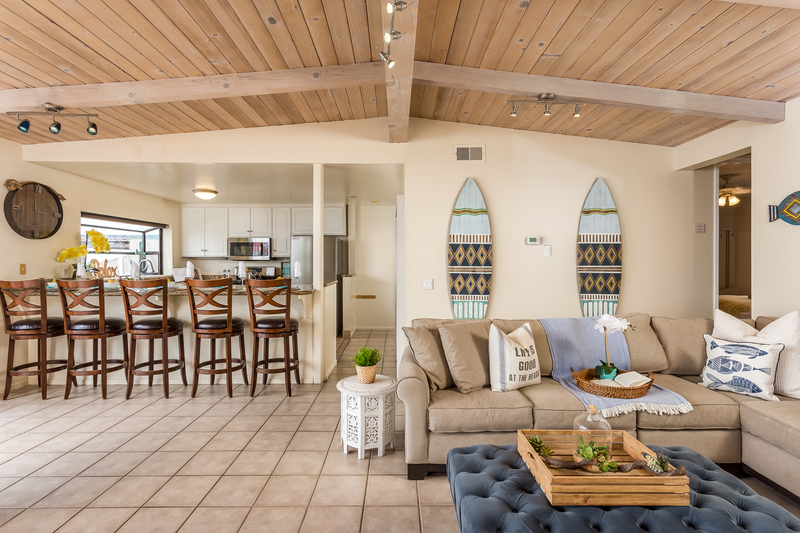 We stayed at 2 properties in Encinitas, E059-0 & E808-0. Both homes are absolutely amazing. This was a girls reunion with college roommates. The entire process from booking to checkout was so easy. I loved the mobile app option to have all of our rental information (arrival/departure info, door access code, what is provided in the home) right on my phone. We had questions when we first checked in and 'Beach Front Only' was very easy to reach and promptly answered all of our questions. 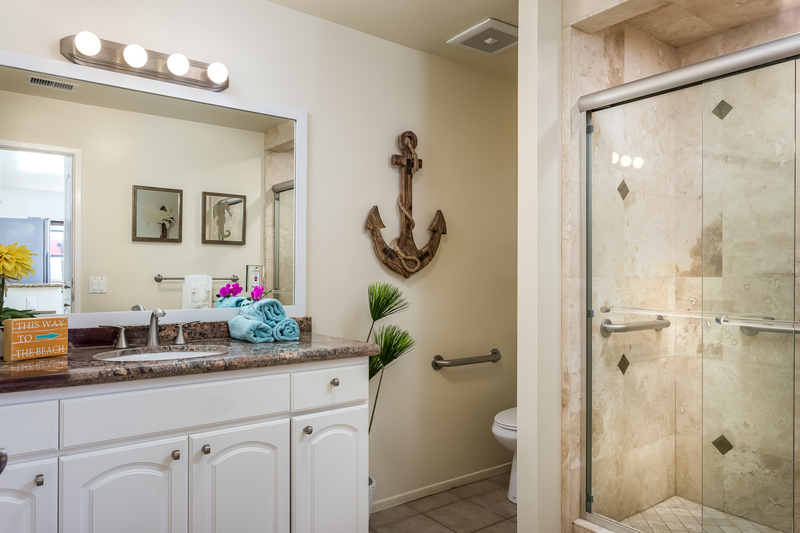 The homes are immaculate, spacious, have perfect deck/patio areas with amazing ocean views, fully stocked kitchens, and both are very close to the walking path that takes you down to the beach. 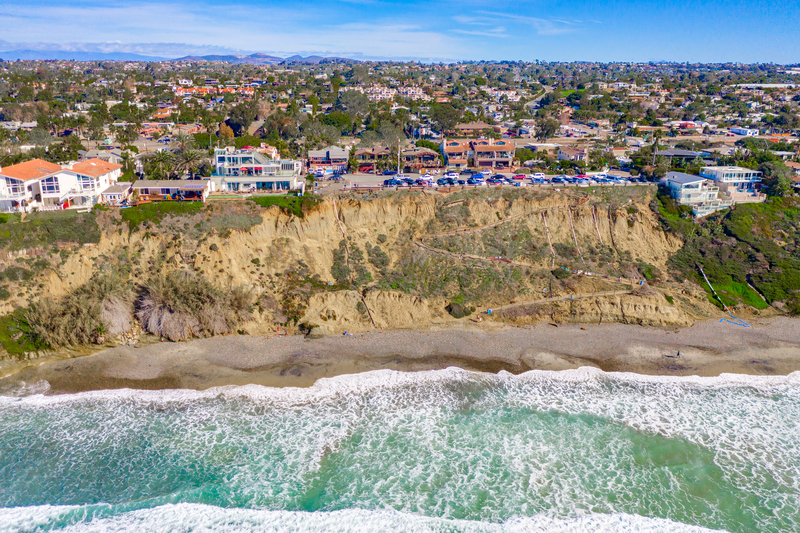 The homes overlook a popular surf spot. We spent our afternoons watching surfers and saw numerous dolphins playing near the shore. I highly recommend booking your next vacation through 'Beach Front Only' and I would definitely stay in either of these 2 properties again. The location and experience are worth every penny! The views are just amazing! The house was right on par with the views. We were very pleased. Our family of 9 (ages 39 - 2) fit perfectly, we actually had room to spare! The putting green was super fun for all ages. We love the patio area & that is where we spent most of our non-beach time. Like another review, we thought the hot tub was bigger that it is, but it is by no means small. We fit in it perfectly & enjoyed every minute of it! We live in Florida (for now!) so we are used to AC, but with the breeze it was better than AC. The beach access through Beacon's Beach is quite different than what we are used to, but we all got used to it the first day. The beach was just too perfect & so not crowded. Everyone was super friendly. Our kids had surfing lessons right on Beacon's Beach one day. I have to recommend / We had 5 kids in his surf lesson. He and his team were FABULOUS, so kind! After that 1 surf lesson, our kids were surfers! We even rented them boards for the rest of the week. The Beachfront Only staff was very helpful, but we did not need them much once we were booked. The place is pretty stocked with essentials. The only thing we would like to see is some beach toys. This rental helped to make our beach vacation one of the best! Wonderful time for the family. We came from 3 different states and had a wonderful time. The back yard was safe for the children and the views were amazing. The house was clean and well cared for. The only negative was the heat. We were there in 90 degree plus weather. Apparently no one uses air conditioning there. The management company did their best with providing fans. It was still uncomfortable and unbearable from 4-7pm. Also, the trek up and down the hill to the beach was tiresome. We would probably try and rent on the beach next time and not on a cliff above. We also had a day were locals came and took advantage of our backyard and trashed it. We called the management company and they came and put a lock and the gate to keep them out. It was a bit unnerving. But, even with the few mishaps the stay allowed us to be together and relax. The house was most accomodating for our small family reunion. It had everything we needed to make our stay enjoyable. More than an adequate number of bedrooms and bathrooms, a nicely furnished kitchen and other amenities. Located on a bluff overlooking the beach with easy beach access and a beautiful view of the ocean. Great location with many nearby restaurants and attractions. This place is amazing! amazing location with an obvious incredible view. very close to great coffee shop & restaurants. 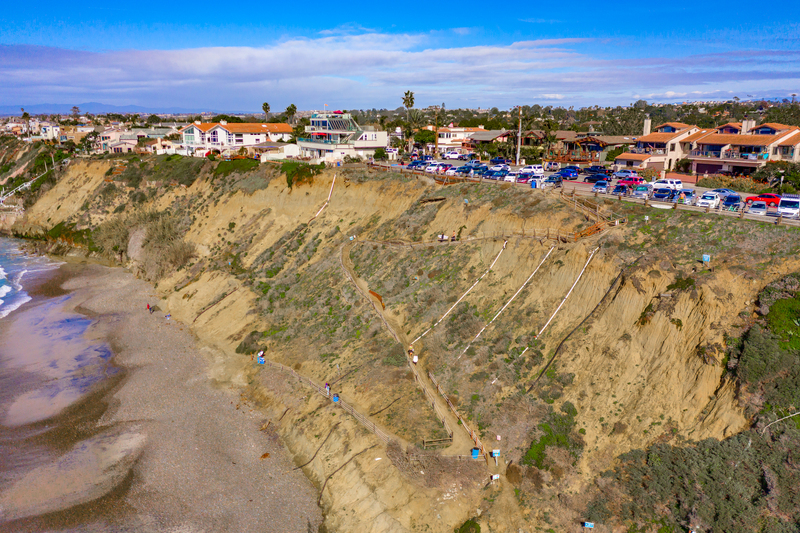 located right next door to the parking lot at Beacons beach and beach access is right there. had a wonderful time and would definitely stay here again. We stayed at this magnificent beachfront home for 4 days. The night we arrived, we had gotten in around 9pm and couldn't quite figure out how to use the key code entry (I was missing pressing a button :). Getting in touch with property management after hours was a breeze and we were inside in a matter of seconds. The location is just stunning. 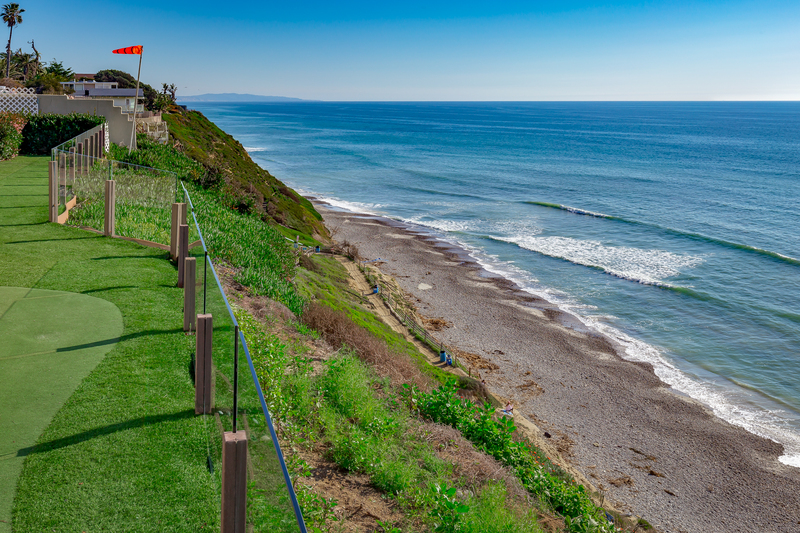 It overlooks the ocean in Encinitas. We watched whales spouting and dolphins jumping out of the water from the jacuzzi on the deck overlooking the sea. 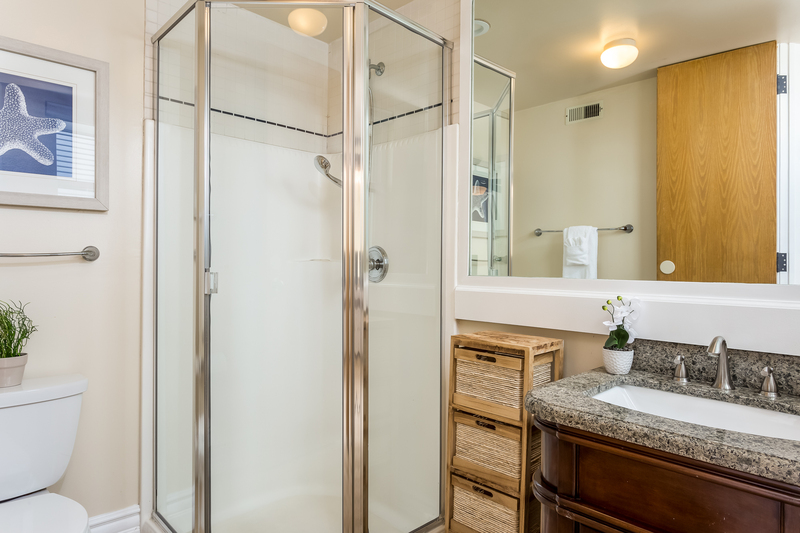 The home is equipped with anything you could possibly need. My Book Club goes on a retreat every year and this summer, I'm recommending 950 Neptune! The property management team is very professional and friendly and made for an easy check in and out. We highly recommend staying in this architecturally beautiful home! Beautiful! The pictures don't do it justice. House is very clean and well-stocked. Our party of 10 (5 couples) loved the privacy of the 5 bedrooms. 2 sets of washers & driers! Perfect views & you can't beat hearing the ocean as you wake up, eat and relax. Quiet neighborhood & everything you need is within walking distance except grocery stores & there are multiple options within a short drive. Only 2 negatives: 1) The hot tub was off when we arrived so it was unusable the 1st night while we waited for it to heat up. It should be hot and ready for guests. 2) The coffee maker didn't work but the management company brought us a new one. We LOVED the house and already want to go back! We have stayed here twice. First for a 105th B-day and the 2nd for a 60th B-day. Being next to the ocean 24/7 is wonderful. We were outside almost as much as inside. Watching the sunset and moonset, surfers, dolphins and whales, kids playing below, reading or sleeping to the sound of the waves- ahhh, loved it! Plenty of space inside too. A favorite of mine was to get up early, turn on the instant fireplace have my cup of tea. Always great memories here for us, thanks! Our extended family vacay was one of the best ever. We loved the location...spectacular views, and right next to the beach trail. We had some small issues which were solved by a phone call and visit by staff. We would definitely come back! This is the second time we have stayed and we love it. It is a beautiful house with an amazing view. I highly recommend staying! The vacation house is more exciting than the pictures! fully equipped, amazing view, and convinient location to restaurants, groceries, and highway. We stayed in the house in Feb, accomandating 11 family members, including kids and grandparents.... everybody loved the choice! thank you, manager and owner! All four of my kids, 2 spouses and one grandchild loved our stay in this house. The view is extraordinary; the kitchen well-sized for two chefs to work together and there is enough common and bedroom space to allow us to be together or separate as needed. It was a lovely five days in a great neighborhood. Overall, this property is very nice and conforms with the information on the website. 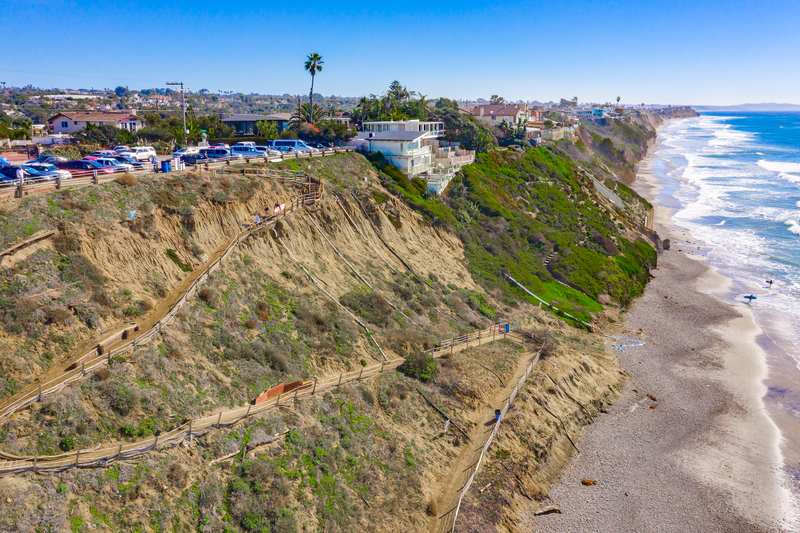 The location is great - nice neighborhood, incredible views, and a quick walk down the trail to the beach. On the positive side - the property is huge. plenty of room for a family or even families to spread out. Great kitchen which is fully equipped, though with all of the great restaurants in walking distance we only ate breakfast in the unit. Now for the negatives. The parking space allocated to the unit is a very narrow driveway. Only about two feet wider than the rental car, so everyone except the driver had to get out before we parked. And backing out of the driveway is "blind" because of the wall beside the driveway (and because the on street public parking basically pins you in to the driveway with mere inches on either side). Another thing to consider is that the hot tub on the back porch is a portable model that is much smaller than it looks in the picture. Made for two people, but maybe you can squeeze four into it. Another thing you should know is that all of the plumbing appears to be on sump pump. Because of this - I think - all of the bathroom sinks are raised up about 6 inches higher than normal. For the shorter people in our party, they had to stand on tip-toes to wash hands and brush teeth. We wanted a local place to stay on the beach. This place was perfect for our 9 adult children and spouses and 2 grandchildren. Everyone thoroughly enjoyed the view. The terrace area was safe for the 11 month old to crawl about with the glass enclosure. the putting green was a hit. Having 5 baths was perfect for no post beach prep. Place is well equipped. the only add we would suggest is a garbage disposal and trash can located by the sink. We enjoyed the house and it was very well equipped. We were surprised that there was no air conditioning but we were lucky that the heat moderated and the fans were adequate. The location was excellent. We rented the beach house during a family vacation and couldn't have had a better time. We have three children 5 and under and grandparents 65+, house was safe and enjoyable for all. We will definitely be back another time, a great experience. Also, the management company was always accommodating and available, first rate.